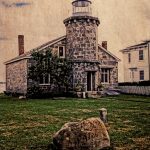 The American taxpayers have known few such bargains as the hexagonal, cottage-type Drum Point Lighthouse, which cost only $5,000 to build. It is a white hexagonal cottage of 1½ stories sheathed in clapboard siding and covered with a seamed metal roof painted sienna red. The main level possesses a gallery deck with square balustrades and a circular handrail, and there are six double hung windows that overlook this level. Two doors provide entry into a first level sitting room, dining room, kitchen and a bedroom for the keeper. A wooden support column extends through the center of the lighthouse, and a spiral staircase winds around this pole. The structure’s second story sports an extra bedroom and a space for the fog bell. A second staircase ascends to the lantern room, which has cast iron mullions and a pyramidal roof capped by a ventilator ball and lightning rod. The octagonal lantern is painted black, and is made of wood sheathed in metal. Construction of the light was achieved by prefabricating most of the parts and barging them to the site. In this manner, the beacon was erected in about a month. Allentown Rolling Mills of Philadelphia provided the wrought iron piles for the foundation, which were ten inches in diameter and bored directly into the sandy river bottom. Workers began assembling the structure on July 17, 1883, and the lighthouse was activated just over a month later on August 20. 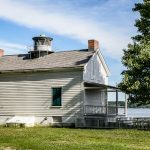 Drum Point Lighthouse has been fortunate to avoid the fate of many Chesapeake Bay screwpile lighthouses, which being in deep water were often damaged by ice floes, struck by ships or wrenched off their foundation pilings altogether. The Drum Point station was originally built in ten feet of water, but the effects of shoreline silting reduced that depth over the years. 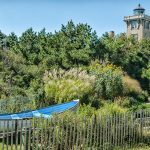 By 1900 the Bay only came three feet up on the pilings, and in the 1970s Drum Point Lighthouse was perched above dry land. 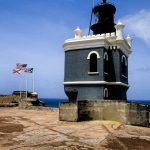 This little lighthouse served faithfully for nearly eighty years. The lighthouse had a fourth-order Fresnel lens whose red light could be seen at a distance of eleven nautical miles and likely cost more than the lighthouse itself. It warned mariners of the dangers of Drum Point until 1962, when the station was taken out of service. 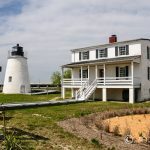 The federal government eventually decided to deed the lighthouse to Calvert County, but to keep the land for itself. 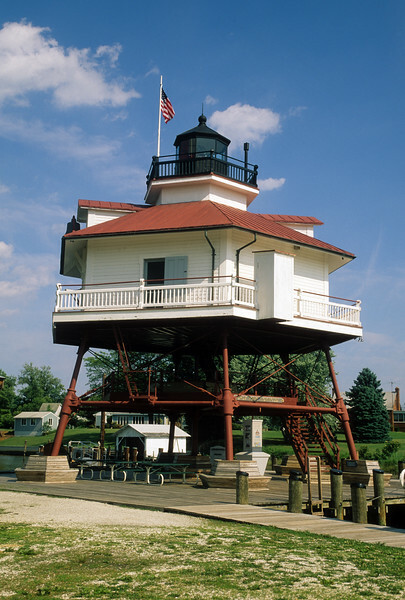 The Society obtained a $25,000 grant from the Maryland Historical Trust to move the lighthouse two nautical miles up the Patuxent River to a pier on Backwater Creek, near the Calvert Marine Museum. The first step was to cut the iron pilings. The moving crew was surprised to find that the 10-inch diameter beams were composed of solid metal, which necessitated an extra day for cutting, and also meant that the structure’s weight was much greater than anticipated. Still, within two days the 41-ton lighthouse was freed from its foundation and barged to its new museum home. 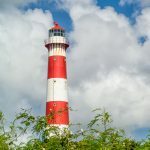 Click here for a guide to over 750 lighthouses in America that you can visit. That is quite the unusual lighthouse Mark. Nice writeup and images. Yes I like the cleaner look Mark and once again a fascinating post! Nice image of an unconventional lighthouse. I actually am excited to see a lighthouse personally.. I just hope soon I can do it and even with my kids as well.. Excellent write up Mark. I love lighthouse but have never seen one such as this. Very nice. I always enjoy these write-ups on historic items. I have fished the waters off of Solomon’s and Drum Point many times so it’s nice to see this lighthouse. 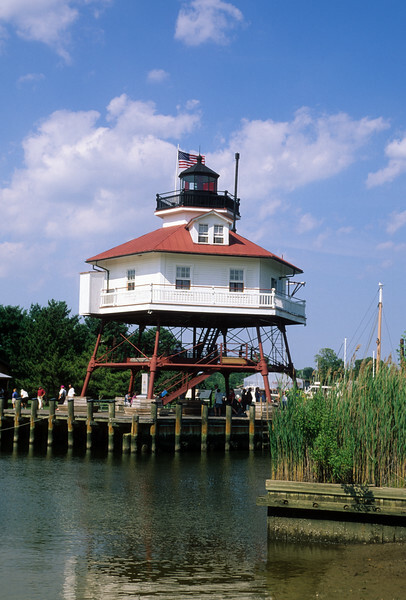 This lighthouse is similar in design to the Seven Foot Knoll Lighthouse Museum in Baltimore’s Inner Harbor. You’ve done a very nice job with these images, Mark. Lots of history with this old Light.